Spells are a set of words which are spoken or unspoken, usually to cause a magical effect on someone or something! These could also be used to call upon a deity, spirit or any other supernatural beings! NetEnt has managed to bring these folks to life on a 5 reel and 20 payline slot game. 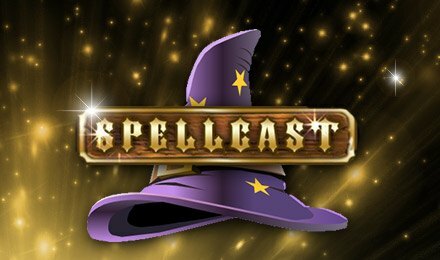 Spellcast comes with cutting-edge graphics and wonderful animations that will surely keep you entertained. Aside from the build of the game, come across symbols that are in accordance with the theme. Creepy castles, crystal balls, witches, magic potions, spell books, wands, A, K, Q, J, 10 and 9 are the symbols that will trigger wins as you spin the reels! Adjust your bets on Spellcast slot by toggling the right or left buttons on the Coin Value Field. Also, set your bet levels on the Level Field. Autoplay is at hand, and lets you set your game to auto with a selection of 10 to 1,000 spins. Use the Bet Max button to set the maximum stakes and levels without having to do it manually! Bet Levels: Bet levels range from 1 to 4. Amount of Paylines Selection: All 20 paylines are fixed. Coin Values: Stakes available are £0.02, £0.05, £0.10, £0.20 and £0.50. The wild symbol of the game is the Wizard. This replaces all other symbols except for the scatter. When the wild symbol features in a winning combination, it doubles the outcome of that spin. 2, 3, 4 or 5 symbols on a payline award 0.5x, 12.5x, 125x or 500x your stake. The Crystal Ball is the scatter symbol of the game, and awards 2x, 5x, 25x or 500x stake multipliers for 2, 3, 4 or 5 symbols. Land three, four or five of these symbols anywhere in view and receive 15 free spins to play! All wins generated from this feature are subject to a 3x multiplier. Landing more of these symbols retrigger the feature!